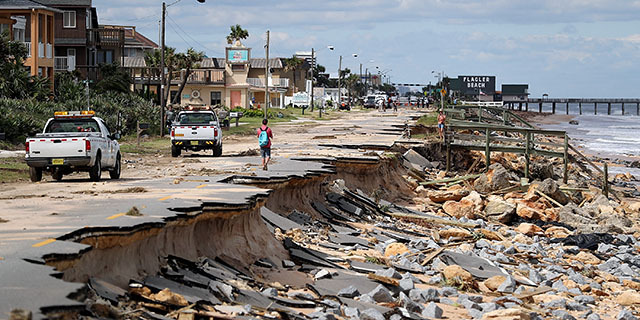 Roughly six-in-ten Americans (59%) say climate change is currently affecting their local community either a great deal or some, according to a new Pew Research Center survey. 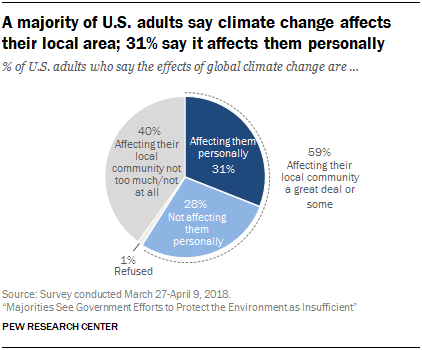 Some 31% of Americans say the effects of climate change are affecting them personally, while 28% say climate change is affecting their local community but its effects are not impacting them in a personal way. As is the case on many climate change questions, perceptions of whether and how much climate change is affecting local communities are closely tied with political party affiliation. About three-quarters of Democrats (76%) say climate change is affecting their local community at least some, while roughly a third of Republicans say this (35%). But politics is not the only factor related to these views. Americans who live near a coastline are more likely than those who live farther away to say climate change is affecting their local community. Two-thirds of Americans who live within 25 miles of a coastline (67%) say climate change is affecting their local community at least some. In contrast, half of those who live 300 miles or more from the coast say climate change is affecting their community. This difference exists among both Republicans and Democrats. For example, 42% of Republicans and Republican-leaning independents who live within 25 miles of a coastline say climate change is affecting their local community, compared with 28% of Republicans who live 300 miles or more from the coast. 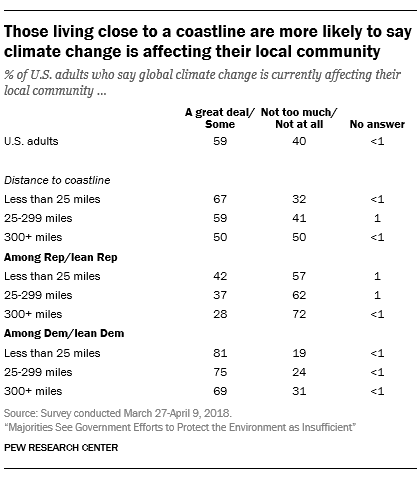 And about eight-in-ten Democrats and Democratic leaners (81%) living within 25 miles of a coastline see a local impact from climate change, compared with 69% of Democrats living at least 300 miles inland. Scientists say sea levels are rising, and a recent study found this is happening at an increasing rate. Sea level rise could endanger coastal communities, which are especially vulnerable to floods and storm surges. Americans who live near the coast are also somewhat more likely than those in interior areas to say the effects of climate change are affecting them personally: 37% of those who live within 25 miles of a coastline say this, compared with 25% of those who live 300 or more miles inland. In the new survey, the Center also asked people who said climate change is affecting their local community to describe those effects in an open-ended format. People who live close to a coastline and people who live farther away tend to point to similar effects. For example, 44% of those who live within 25 miles of a coastline and 46% of those who live more than 300 miles away say climate change is currently affecting their community through weather and temperature changes. Americans in coastal areas differ from those further inland in at least one other way: Those living within 25 miles of a coastline are less likely than those living 300 or more miles away to favor expanding offshore drilling for oil and gas (33% vs 42%). This modest difference reflects the fact that Democrats are more likely than Republicans to live within 25 miles of a coastline, since neither Democrats’ nor Republicans’ views of offshore drilling differ by distance from the coast. A Pew Research Center survey conducted in January found somewhat lower levels of support for more offshore drilling among those living within 25 miles of a coastline. Note: To calculate the distance to the nearest point on the U.S. coastline, respondents with valid ZIP codes were located at the ZIP code centroid (from the 2016 definition of the ZIP code tabulation areas provided by the Census Bureau). The minimum distance between each respondent’s ZIP code and the nearest point on the coastline was calculated using the spherical law of cosines approximation.